Malaysians deserve a great breakfast to start a great day. Come celebrate McDonald's Breakfast Day on 19 November with a FREE Egg McMuffin - made with a perfectly cooked farm fresh egg, deli style smoked chicken roll and cheese in a toasted English Muffin. Enjoy a great start to a great day! 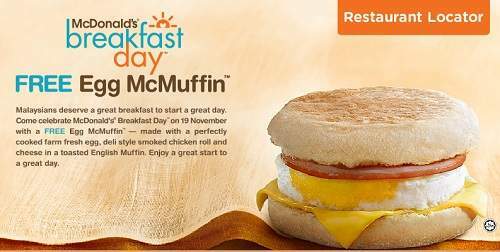 Free Egg McMuffin limited to the first 1,000 customers per restaurant from 7am to 10am, whichever comes first. LIKE & SHARE out this great McDonald's treat!